I had a great time again birding in one of my favorite counties and contributing to the annual Christmas Bird Count in the Bronx. I assisted to cover the East Bronx and was in a team consisting of Eric Miller, Jean Loscalzo and George Dadone. We made an excellent group, who were up to the task of bushwhacking, climbing fences, navigating streams and climbing walls in an effort to dig up as many birds as possible. It was an exhaustive day, but we all had a good time of it and no one complained. 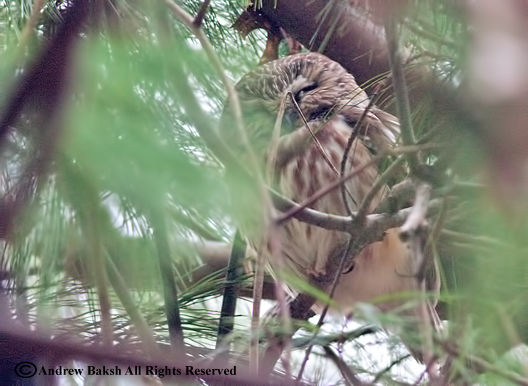 We ended up with an excellent run of birds including 4 species of Owls and 3 species of Warblers. 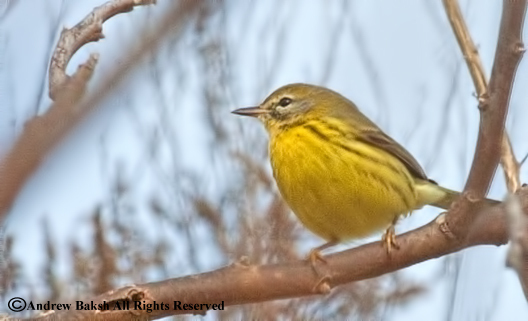 One of the warbler specie, Prairie Warbler, was a second count record in the 89 year history. 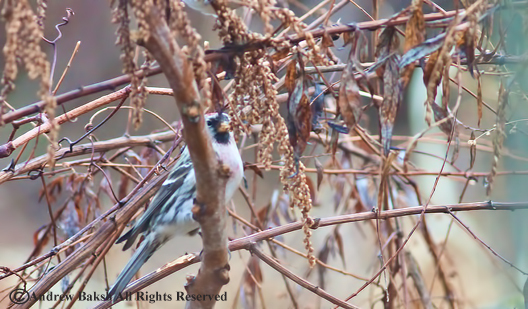 Other highlights of the count included a couple of new birds for the count - the continuing Barnacle Goose at Van Cortlandt Park, a reported Magnolia Warbler was photographed in Wave Hill (I have not seen the photos) and two Clay-colored Sparrows, 1 at Pelham Bay and the other at Rye Playland. In total the count tallied 126 species, which tied for the all time high. 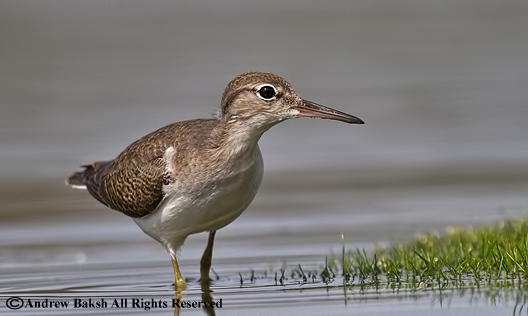 I was lucky to obtain some photos of the great birds my team found - see below. 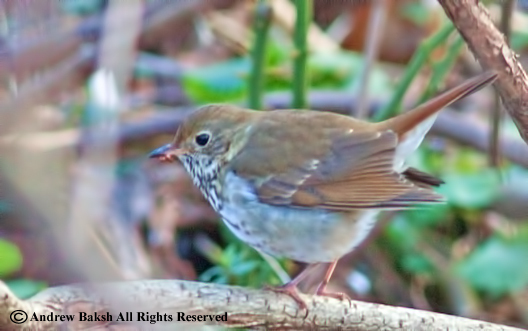 1 of 2 Hermit Thrushes we found. 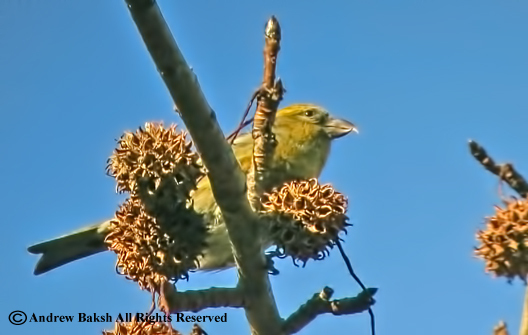 White-winged Crossbill, we had a total of 26 which was a conservative count. 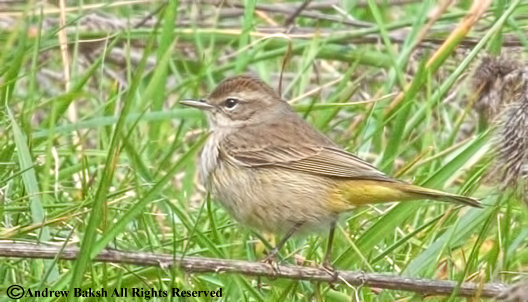 Western sub species of Palm Warbler. Prairie Warbler, only the 2nd record in the 89 year history of the count. 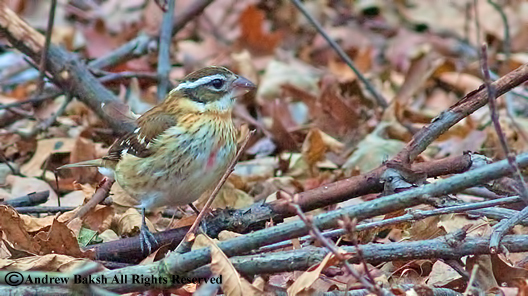 A call from Karlo Mirth who relayed a message from Danny Melore that he had seen a "possible" Rose-breasted Grosbeak at the Water Hole in Forest Park Queens, pulled me out to that location to verify the ID. Eric Miller and I had earlier discussed teaming up to bird the location, but Karlo's phone call moved up my plans and I was at the scene within minutes of the call. 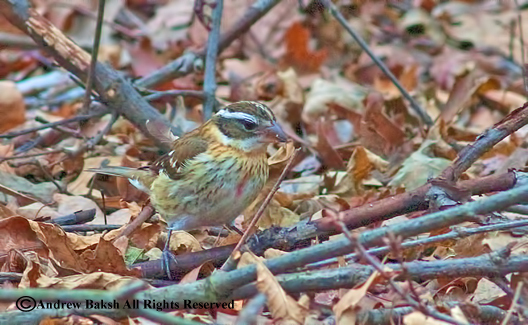 Given the date and the description of the bird, I wanted to ensure that the "possible" RBGR (Rose-breasted Grosbeak) was not a Black-headed Grosbeak. When I arrived, Jean Loscalzo was already on the scene, she had received a phone call, from Danny. 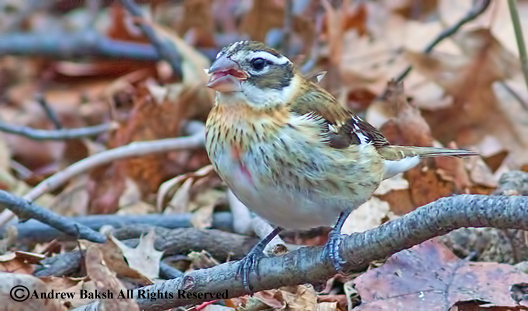 Eric soon arrived shortly after and with Jean and I, began the vigil for the Grosbeak while debriefing Danny. On Saturday, I was in the Bronx leading my Van Cortlandt walk when the cell rang. 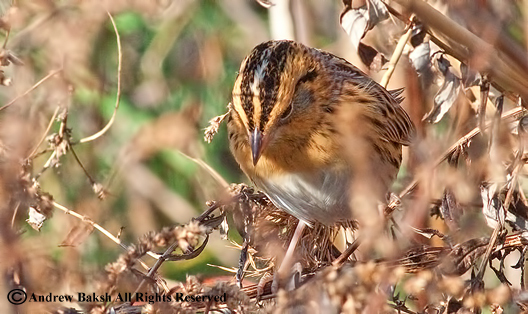 It was Corey Finger and he in a voice that I knew meant he had something good asked me how long would it take for me to get to Queens since he had just found a...wait for it, a Le Conte's Sparrow at the Edgemere Landfill in Queens. I was ecstatic! 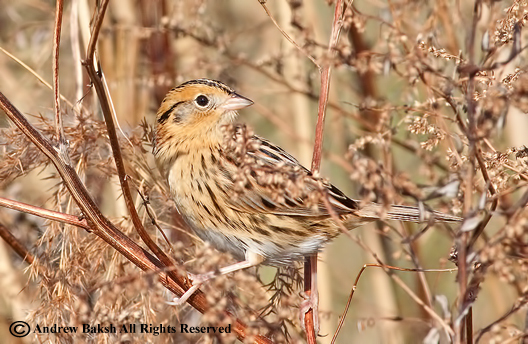 This was awesome news, a Le Conte's Sparrow (Ammodramus leconteii) was a very, very good bird, plus it meant that the bird would be falling into the count period for Queens. 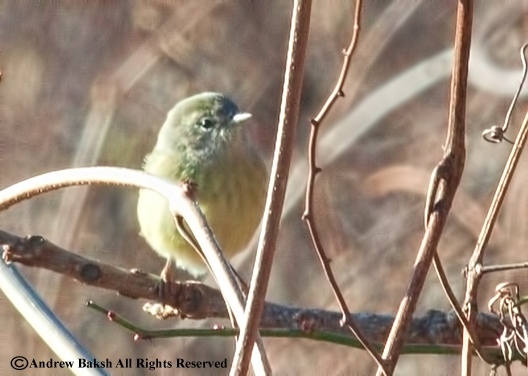 Since the Virginia's Warbler our recent pride and joy was a no show at Alley Pond Park in recent days, a Le Conte's would make a FINE consolation. Corey sent me a photo of the bird taken from the display of his camera's LCD. I looked it over carefully and while the photo was one taken from an LCD image, I thought it looked good!! I immediately began thinking about making a run for the bird. But wait! Was I being greedy? 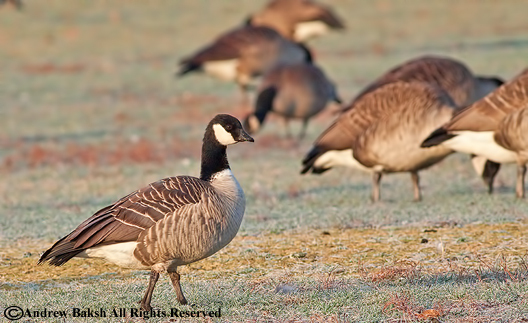 I already had a fine morning having had stellar looks at a Barnacle and Cackling Goose. 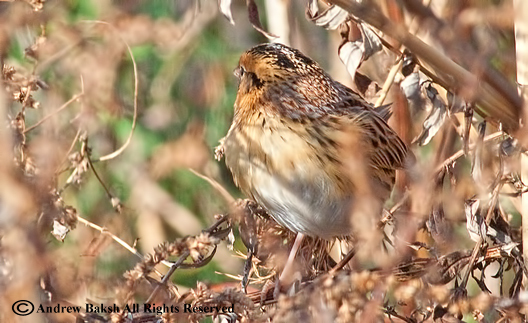 I had planned on birding the Bronx after my walk, but a Le Conte's Sparrow (Ammodramus leconteii) was too good to pass up. My friend Andria who was with me on my walk looked at me after I had spoken to Corey and she knew I had that "chase" look in my eyes. The rule of "striking while the iron is hot" was already in motion. The walk was coming to an end and so the timing was perfect. I discussed with Corey the location and then it was back to Queens. How confident was I of the ID? 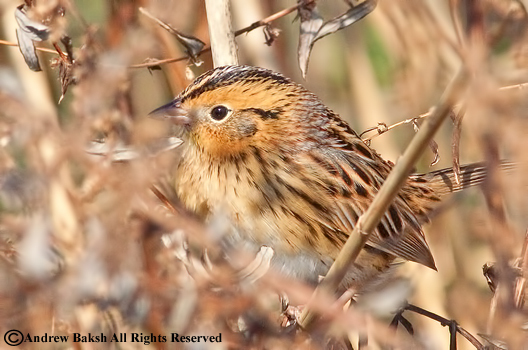 Well, for one I did not call Corey during the ride to Queens to get more specifics on the bird, but instead began to think about the field marks and behavior of a Le Conte's Sparrow (Ammodramus leconteii). When I got there Corey was having a discussion with another birder who covers the area for the CBC and he was expressing some doubts while looking at Corey's photos. I looked at other photos on Corey's camera and tried to make sense of why Bob Dieterich (sp) was having doubts. After listening to Bob, I decided he was just being cautious and I respected that. But enough talking, I wanted to see the bird myself. 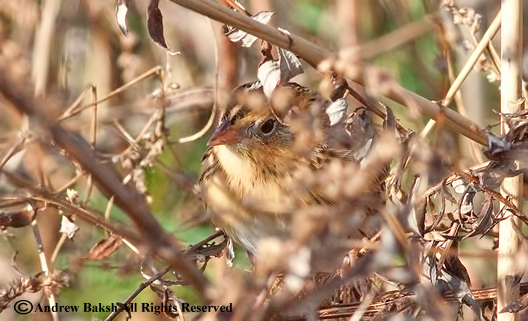 Corey led the way and after walking the edges of a phragmites lined ditch where the bird was last seen, we found it foraging on Mugwort seeds. Most of the time it stayed very secretive moving/running on the ground in typical Le Conte's fashion and staying out of sight. However, we patiently watched and waited and slowly we began to get a picture of the bird. At first a tail, then a partial head and then the face. Working with bits and pieces, I began to put this bird together for my own ID purposes. We observed and photographed the bird trying to document the bird and I made notes of its behavior while listening to its chip note (when it chipped). Finally it came out more into the open and we were able to study and photograph the bird. Any doubts that Bob had raised were removed once I saw the bird well enough for myself. Corey had struck GOLD. 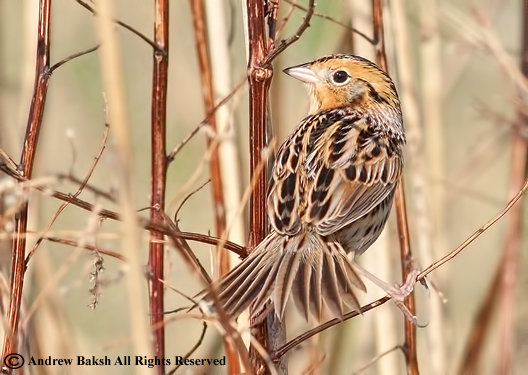 This was a Le Conte's Sparrow!!! I turned to Corey and stated that I had no doubt, it was a Le Conte's! Corey seemed relieved. I even got Andria's input much to her amusement, but I thought it was perfect. Here was a relatively new birder not corrupted by "raritis" who could gave a non influenced, non power of suggestion feedback. Her thoughts? Well after consulting her field guide and studying the bird, her vote was for a Le Conte's...it was now 3-0 in favor. We continued to observe the bird as it moved around in a secretive manner just like the rodents that populated the landfill. We were waiting on one other birder that Corey had told, Anthony Collerton and rightly so because Anthony was doing a NYS big year. Soon Anthony arrived and he did not have to wait long as the bird showed itself and he took several photos and engaged in the discussion on the ID. 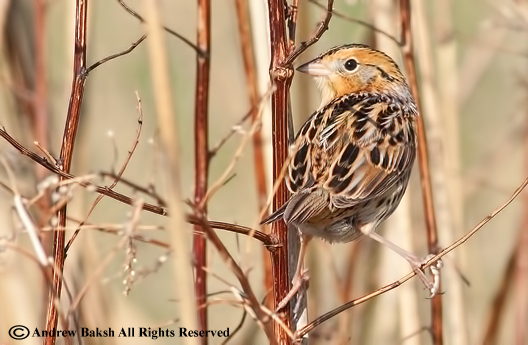 By then, I was not allowing anything other than Le Conte's Sparrow (Ammodramus leconteii) to filter into my head. I was more interested in the dilemma that Corey was faced with. You see the Edgemere Landfill, is not exactly park land that would be readily accessible to all. Only a few of us have birded the area and always with caution for fear that access to the location would be denied if things got out of hand. 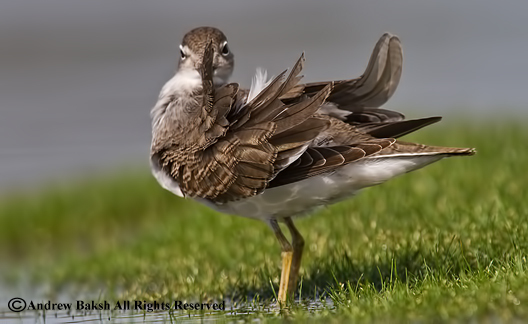 So Corey struggled with what to do, plus he had to think about the Queens Christmas Bird Count. Corey was concerned and rightly so given the legality of birding at Edgemere and the possibility of hordes of twitchers descending on the area, with some more well behaved than others (I shuddered to think of some folks running rampant over the landfill tapes in hand blasting away). It was not an easy decision to make but it was Corey's bird, his call and I indicated my support for whatever his decision was. (see his post here as he discusses his decision and why). 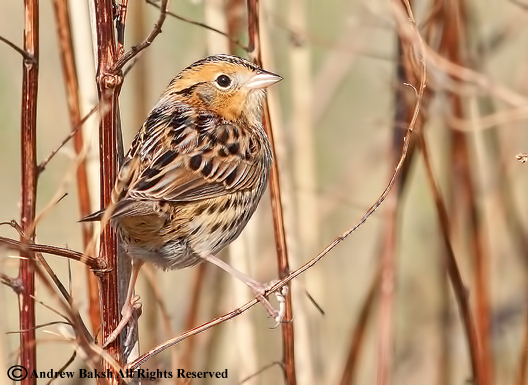 The Le Conte’s Sparrow was discovered by John James Audubon, and it was thought that he named this bird after a friend, Doctor Le Conte. It is generally believed that he meant John Lawrence Le Conte, although some feel that he was referring to another John Le Conte, also a doctor, and John Lawrence's cousin. Le Conte’s prefers moist open grassy areas with sufficient vegetation cover to provide shelter. 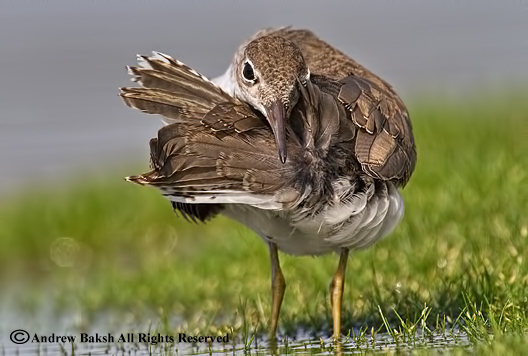 Habitats like meadows, fields, shallow marshy edges are all the types of places it prefers. 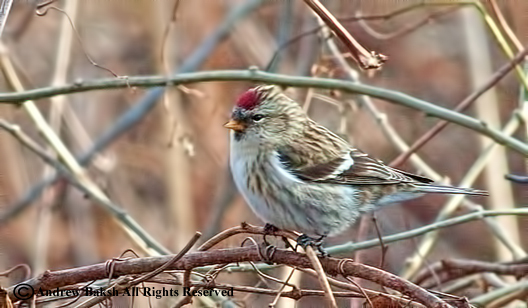 The ditch with the phragmites edge was perfect for this little guy who was rather cooperative unlike my life Le Conte's on Long Island. A Terrific bird for Queens and I was very happy to see it and happy for Corey because it was his little patch that he has been birding faithfully. Thank you again Corey for the find, and the call. Here are some of my photos. 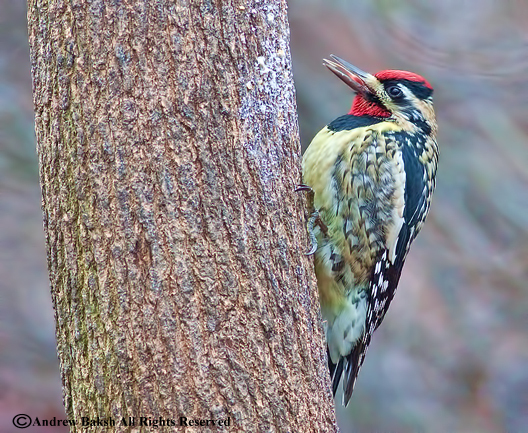 A beautiful day at Van Cortlandt Park in the Bronx was highlighted by a couple of rarities and some hardy birds that would look good on a Christmas Count list. 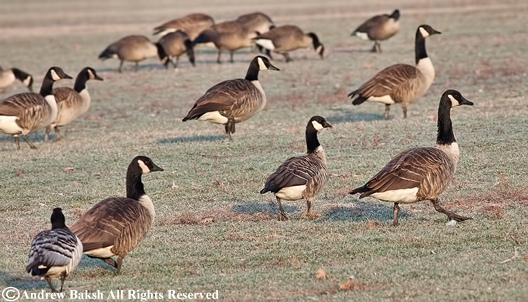 With the Bronx Christmas Count just around the corner, I eagerly sifted through the flock of Canada's on the Parade Grounds this morning before our walk began hoping the Barnacle Goose (Branta leucopsis) was still around. 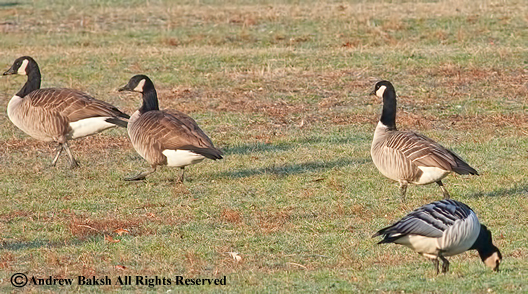 It was and we had a bonus, as I picked out a Cackling Goose (B. h. hutchinsii) from the flock. 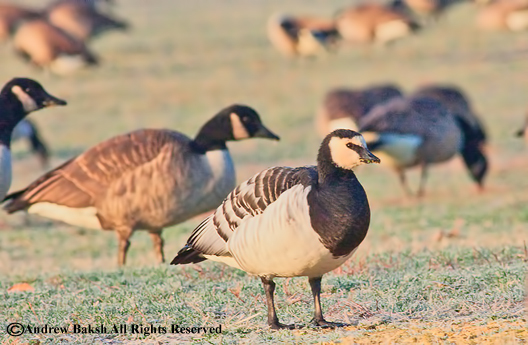 Our group had excellent looks of both species and we took some time studying the Cackling Goose, which appeared to fit well for B. h. hutchinsii – Richardson’s (or Hutchins’s) Cackling Goose. It was small and lighter colored. While doing our Geese studies, we were pleasantly surprised by a couple of American Pipits flying overhead. Later on our walk we had excellent looks at Rusty Blackbirds, Belted Kingfisher (female) and an assortment of waterfowl. In total we had 37 species. Barnacle Goose lower left with Cackling Goose walking right. Cackling Goose a real beauty! 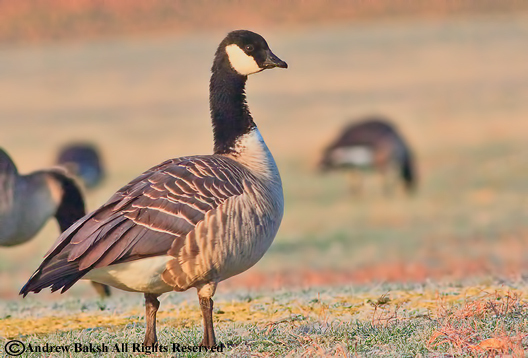 Cackling Goose with the rising sun providing soft tones. Here are a couple of birds that will be good ones to get on Christmas Counts. These were seen at Kissena Park in Queens and hopefully they stick around until the count on Sunday. 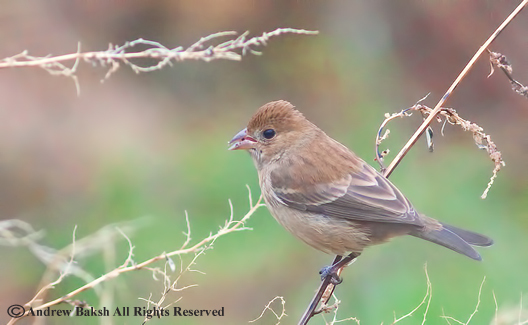 Those LBJ's aka "little brown jobs" a term used synonymously to describe those tough brown passerines or more likely SPARROWS. A conversation I had recently with my friend Eric Miller reminded me about an LBJ that I tried for in Arizona. My friend Jeff and I had spent over an hour in the blazing sun looking and Jeff was on the verge of giving up, but I was a stubborn SOB not wanting to leave. I mean it was an LBJ and the challenge of finding the "target" bird had me all pumped up. There was no way I was going to leave! Poor Jeff, he was going to have to drag me away kicking and screaming and I did not think he was keen on doing that. Of course since he was the pilot, he could have easily driven off in frustration, but he is too much of a nice guy to contemplate that, at least I comforted myself that he wouldn't. Finally, I suggested that Jeff stay in the car and I decided to walk, for two reasons. One, I did not want to hear another word from Jeff about leaving and second, I wanted to listen for this bird. It was the listening that did it and I found the bird (s) after walking about a mile up a cattle trail. Of course after getting Jeff on the bird it was all good and the world was in balance again. 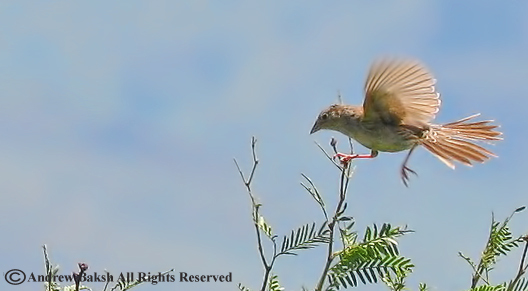 Knowing that it was in Arizona, can you guess which Sparrow it was?